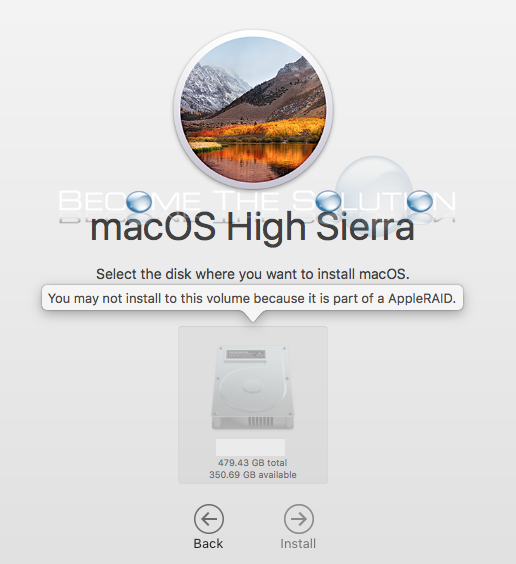 If you are trying to upgrade or install the latest version of Mac OS X High Sierra, you may be greeted with an unwelcoming message if you attempt to install onto a RAID 0 hard drive configuration. You may not install to this volume because it is part of a AppleRAID. At this time, there are several users reporting the same upgrade issue with Mac OS High Sierra on the Internet. Some users have opened official Apple Bugs for this issue (including bug 34756034 and you can check bug status on Apple’s site here.) An official from Apple also states “This looks like correct behavior, we stopped allowing installs to RAID set members in macOS 10.13 (High Sierra). At this time, you will have to wait for Apple to fix this in a new build of Mac OS X 10.13 High Sierra. At the time of this article (November 14, 2017) the current version of High Sierra in the App Store does not fix this issue. If you have found a workaround for this, please use the comment form below.